Important area of the boot in regards to the upper cuff that wraps the lower leg and is where most power is generated from the skier to the ski. If not a secure fit around the leg the skier may experience a common foe known as shin bang. Below average height of the instep area of the foot and not uncommon to someone who deals with flatter feet. 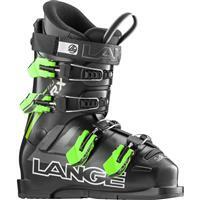 The Lange RXJ is the ideal boot for kids who enjoy All Mountain skiing. JUNIOR FIT- Anatomical fit for junior skiers. CONTROL FIT TECHNOLOGY- The combination of shell last and liner execution to fit more feet accurately and comfortably. Control Fit shell technology: Lange scanned the feet of 20,000 skiers from around the world with a new, state-of-the-art 3D imaging system. Through this analysis, Lange learned that most skiers benefit from a wider, asymmetrical toe box combined with a slightly narrower, more articulate ankle pocket than is found in most of our competitors products. We believe the combination of more room in the forefoot and more accuracy in the ankle delivers the best of both worlds: comfort and performance. Control Fit liner technology: Lange incorporates the features, practical techniques and attention-to-details that boot-fitters have used for years to accommodate the hard-to-fit "deal breakers" that have traditionally impeded fit and sales. As all boot-fitters know, the difference is in the details, and our details must be seen to be believed. NATURAL SKI STANCE- Lange employs the unique Natural Ski Stance that allows skiers to stand a little straighter for more efficiency and less fatigue.